For two years, Rachael Flatt has watched the U.S. Championships medal ceremony from the second spot on the podium. But in Spokane, Wash., Flatt finally stood atop the medal stand, following a record breaking performance that pushed her past 2008 U.S. Champion Mirai Nagasu, who led after the short program. “I finally competed the way I’ve been training,” said Flatt, a 17-year-old high school senior at Cheyenne Mountain in Colorado Springs, Colo. She scored a personal best in her third place short program Thursday and again Saturday to set a national record 200.11 points, besting the mark of 199.18 that Sasha Cohen set in 2006. 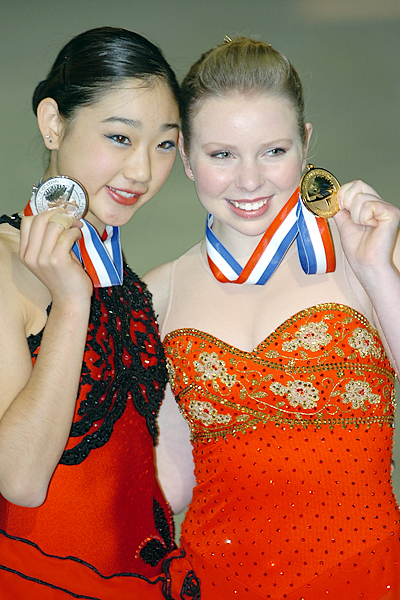 Both Flatt and Nagasu are first time U.S. Olympians heading into the 2010 Olympic Winter Games in Vancouver, Canada. U.S. Figure Skating announced them as the two representatives almost two hours after the conclusion event, time in which the 36-member international committee chaired by Lorrie Parker mulled over possible team members. “It’s a great time in my life – senior year in high school and now I’m making the Olympic team,” Flatt said. She received 130.76 for her “Rhapsody on a Theme of Paganini” free skate, which included seven triple jumps, highlighted by the triple flip-triple toe combination, and two Level 4 spins. When Flatt skates at the Olympics, nine colleges including Dartmouth, Harvard, Princeton, Stanford and Yale will be considering her application for fall 2010 admission.”Hopefully, they will take this into account,” joked Flatt, who is enrolled in four Advanced Placement courses despite her demanding training. In the time between the free skate and the announcement Nagasu, 16, who had three under rotated jumps in her spirited performance to “Carmen,” said she asked friends to keep their fingers crossed that she would make the cut. “Maybe their crossed fingers worked,” she smiled. The alternates are bronze medalist Ashley Wager (184.70), who placed second in the free skate, pewter medalist Cohen (174.28) and fifth-place finisher Christina Gao (156.53). Wagner and Cohen are also alternates to the 2010 World Championship team along with seventh-place finisher Beatrisa Liang (147.71). Nagasu acknowledged that she was nervous she might be passed for Wagner because “Ashley had a really good season” before taking bronze in Spokane. Wagner completed the most successful fall international campaign of any U.S. lady in the Olympiad, winning silver at Rostelecom Cup and bronze at NHK Trophy. She was fourth at the Grand Prix Final. Wagner fell on the triple Lutz in her fourth place short program, putting her about seven-and-a-half points out of the lead. She wound up about four points out of the silver medal with help Saturday from a five-triple comeback performance in which she performed an opening triple flip-double toe-double toe. “I accomplished what I wanted to do,” she said about her free skate. Cohen was second in the short program but with problems on almost every jumping pass Saturday, including a fall on the triple flip, and finished fourth in the free skate. It was her first competitive performance she winning the silver at the 2006 Olympics and bronze at the 2006 World Championships. Spokane marks the first time that Cohen has ever finished outside of the top three at a national event. She won the silver medal after winning the short program at the 2000 U.S. Championships but withdrew due to injury in 2001. Cohen received silver in 2002, bronze in 2003, silver in 2004, silver in 2005 and gold in 2006. Defending champion Alissa Czisny, who crashed on her first jump Saturday, finished in 10th place following an 11th place performance in the free skate. Five of her triple jumps were downgraded for under rotation although the last one, a triple toe in combination with a double toe, did not event count because she exceeded the number of allowable combinations. Other results included: Alexe Gilles (143.31), 8th; Melissa Bulanhagui (129.21), 12th; and Becky Bereswill (127.96), 13th. Torino Olympian Emily Hughes (140.60) was ninth. Former World Junior Champion Caroline Zhang (138.27) was 11th.